We recently found one remaining MSD DIS-2 Ignition System in our inventory. Improve the output of your distributorless ignition system (DIS) with MSD's DIS-2 Plus Ignition System. There is a two-step rev limiter, which gives you one limit to set for holeshots and another for top-end performance. For engines using nitrous or high cylinder pressures, you can also program a high-speed retard after the engine hits total timing. Both of these features are easy to adjust with built-in rotary dials. 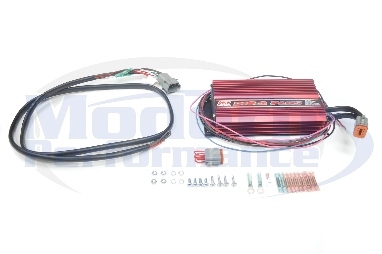 They also feature an ignition interrupt that will prevent the engine from starting by disabling the output to the coil, a retard feature that retards the timing at the top end to prevent detonation, and an LED monitor that will alert you of a low supply of voltage or faulty input signals. The DIS-2 Plus ignitions are designed specifically for 4-cylinder engines. The first time we ever used this DIS2 ignition system was on a 1995-1999 Neon with Hahn turbocharger kit. We used this ignition to retard the timing so we didn't have detonation. This works great on turbo first gen Neons.